Join Bianca Bosker, author of CORK DORK, hailed as the "KITCHEN CONFIDENTIAL of wine", for an unorthodox weekend of wine drinking, blind tasting, and sniffing that will stimulate all your senses and reveal the stories lurking in a glass of wine. Michael and Carolina Ellenbogen are EONS Creative. 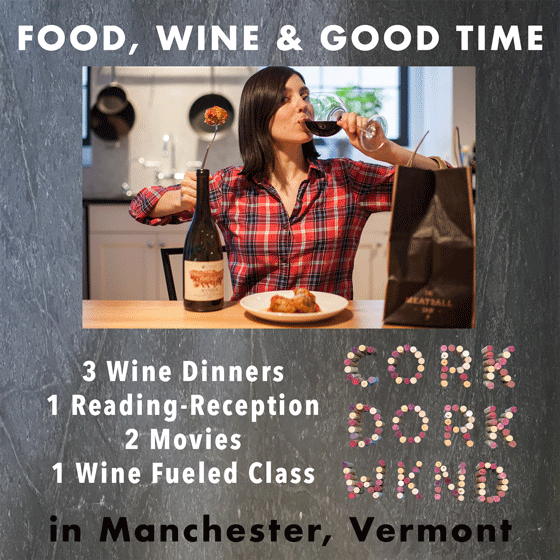 They have chosen Manchester Vermont as the home of the first CORK DORK WEEKEND because of its high concentration of fine dining establishments and resort lifestyle. They develop new businesses and produce motion pictures, events, brands, and digital content. Among other things, they have been running the Village Picture Shows cinema in Manchester since May 2015 and are currently producing a documentary film profiling New York’s iconic Four Seasons Restaurant that opened in 1959 in the Seagram Building and served its final dinner, 59 years later, on July 16, 2016. The New York Historical Society is the documentary’s fiscal sponsor and any person that would like to know more may visit www.nyhistory.org/four-seasons-documentary. Email MICHAEL at or call him at (802) 768-8498. Seating is limited. Advance reservations must be paid in full. Cancellations may be refunded up until May 16, 2017. Contact the Northshire Bookstore to reserve your copy of the book and ticket to the author reading and reception on Sat, May 20 at 4:00 PM. BIANCA BOSKER Bianca traded her role as The Huffington Post's executive tech editor for a job as "cellar rat"--the lowest of the low in the wine world. Inspired by sommeliers who train their senses the way Olympians train their bodies, she plunged inside underground blind tasting groups, Michelin-starred restaurants, high-stakes competitions, and neuroscientists' labs as she trained to become a "somm" and uncover the very nature of taste. Thanks in large part to Plato and Aristotle, who dismissed taste and smell as the least useful of our faculties, most of us ignore two of our five senses. Drawing on Bianca's experience in fMRIs and cellars, you'll discover how to hone your palate, savor wine, and what we gain from moving beyond "mindulness" to "sensefulness." Bianca Bosker is an award-winning journalist and the author of CORK DORK: A Wine-Fueled Adventure Among the Obsessive Sommeliers, Big Bottle Hunters, and Rogue Scientists Who Taught Me to Live for Taste. Bianca has written about everything from Chinese architecture to competitive ax throwing for The New Yorker online, The Atlantic, T: The New York Times Style Magazine, Food & Wine, and The Wall Street Journal. The former executive tech editor of The Huffington Post, she is the author of the critically acclaimed book Original Copies: Architectural Mimicry in Contemporary China. She lives in New York City, where her Instagram alter ego "#Pairdevil" enjoys the challenging of pairing wines with takeout. At Eons Creative we develop new businesses and produce motion pictures, events, brands and digital content. Be informed of opportunities as they arise; request our newsletters and announcements.